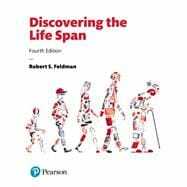 by Feldman, Robert S., Ph.D.
Discovering the Life Span provides a broad overview of the entire range of the human life, from the moment of conception through death. Utilizing a flexible, modular organization, author Robert Feldman covers the life span chronologically and focuses on physical, cognitive, and social and personality development within each stage of life. Feldman’s engaging and accessible writing style makes the material meaningful to students, and prepares them to apply content to their personal and future professional lives. In order to provide an up-to-date snapshot of the discipline, the Fourth Edition includes hundreds of new citations as well as coverage of a number of engaging contemporary topics. Available to package with Discovering the Life Span, Fourth Edition, MyLab™ Psychology is an online homework, tutorial, and assessment program designed to work with this text to engage students and improve results. MyLab Psychology is ideal for courses requiring robust assessments. Discovering the Life Span, Fourth Edition, is also available via Revel™, an interactive digital learning environment that replaces the print textbook, enabling students to read, practice, and study in one continuous experience. Revel is ideal for courses where student engagement and mobile access are important. Robert S. Feldman is Professor of Psychological and Brain Sciences and Deputy Chancellor of the University of Massachusetts—Amherst. He has also served as Dean of the College of Social and Behavioral Sciences and is currently serving as Interim Dean of the College of Education at the University of Massachusetts. A recipient of the College Distinguished Teacher Award, he teaches classes ranging in size from 10 to nearly 500 students. During the course of more than two decades as a college instructor, he has taught both undergraduate and graduate courses at Mount Holyoke College, Wesleyan University, and Virginia Commonwealth University in addition to the University of Massachusetts Amherst. A Fellow of the American Psychological Association, American Association for the Advancement of Science, and the Association for Psychological Science, Professor Feldman received a B.A. with High Honors from Wesleyan University (and from which he received the Distinguished Alumni Award). He has an MS and Ph.D. from the University of Wisconsin—Madison. He is a winner of a Fulbright Senior Research Scholar and Lecturer award, and he has written more than 200 books, book chapters, and scientific articles. He has edited Development of Nonverbal Behavior in Children and Applications of Nonverbal Behavioral Theory and Research and co-edited Fundamentals of Nonverbal Behavior. He is also author of Development Across the Life Span, Understanding Psychology, and P.O.W.E.R. Learning: Strategies for Success in College and Life. His books have been translated into many languages, including Spanish, French, Portuguese, Dutch, Chinese, Korean, German, Arabic, Tagalog, and Japanese, and more than 2.5 million students have used his textbooks. Professor Feldman’s research interests include honesty and deception in everyday life, work that he described in The Liar in Your Life, a trade book published in 2009. His research has been supported by grants from the National Institute of Mental Health and the National Institute on Disabilities and Rehabilitation Research. He is also past president of the Federation of Associations in the Behavioral and Brain Sciences Foundation, an organization that promotes the social sciences, a member of the Board of the Social Psychology Network, and is a member of the Board and Executive Committee of New England Public Radio. Professor Feldman loves music, is an enthusiastic pianist, and enjoys cooking and traveling. He has three children and four grandchildren. He and his wife, a psychologist, live in western Massachusetts in a home overlooking the Holyoke Mountain Range.